Published by the International Centre for Eye Health, London School of Hygiene & Tropical Medicine. 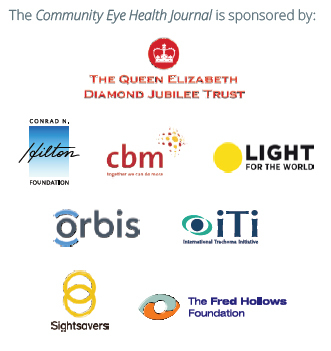 Unless otherwise stated, authors share copyright for articles with the Community Eye Health Journal. Illustrators and photographers retain copyright for images published in the journal. Unless otherwise stated, journal content is licensed under a Creative Commons Attribution-NonCommercial (CC BY-NC) license which permits unrestricted use, distribution, and reproduction in any medium for non-commercial purposes, provided that the copyright holders are acknowledged. Signed articles are the responsibility of the named authors alone and do not necessarily reflect the views of the London School of Hygiene & Tropical Medicine (the School). Although every effort is made to ensure accuracy, the School does not warrant that the information contained in this publication is complete and correct and shall not be liable for any damages incurred as a result of its use. The mention of specific companies or of certain manufacturers’ products does not imply that they are endorsed or recommended by the School in preference to others of a similar nature that are not mentioned. The School does not endorse or recommend products or services for which you may view advertisements in this Journal.